En la clínica PACH, la salud es un derecho humano Por Jackie López | Cronkite Noticias Jueves, 2 de noviembre, 2017. Phoenix Health Clinic Subject Of Upcoming Documentary ‘Salud Sin Papeles’ By Mark Brodie, KJZZ’s The Show, October 25, 2017. 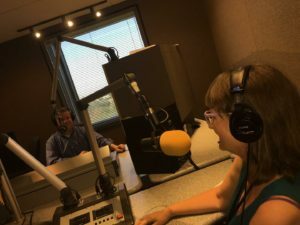 PACH Clinic Director, Amy McMullen being interviewed by Mark Brodie at KJZZ, Phoenix’s NPR station. Salud Sin Papeles tells the story of Phoenix Allies for Community Health. 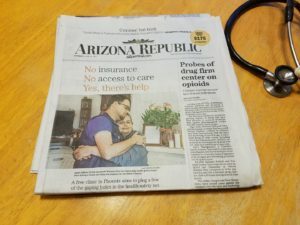 PACH is a free clinic built and run by human rights activists in the heart of Phoenix that provides healthcare to the underserved and uninsured. Aligning with Community Grassroots Media’s focus on social responsibility, this feature-length documentary is run entirely on donations. It is a chance to give back to the community and to highlight the struggles and achievements of one small but growing clinic that is a seed for hope and change in communities across the country. Salud Sin Papeles : Health Undocumented – Official Trailer from Juan D. Freitez Mora on Vimeo. Juan is a Venezuelan filmmaker and video journalist, and he is the founder of Community Grassroots Media. He holds degrees in Digital Video and Film production from Washtenaw Community College, Electronic Media and Film from Eastern Michigan University, and a Master’s Degree in Organizational Leadership from Siena Heights University. His keen eye for visual storytelling and his passion to explore untold and underreported stories was refined under the mentorship of Terry Bennel, an award-winning editor and director for such companies as the BBC. Taking him across three continents, Juan’s work has been featured on a number of national and international publications including PRI’s The World, NPR, The Huffington Post and The National Journal. He has worked with international corporations such as BE Aerospace and Silicon Valley’s Global Innovation Summit as well as with many national and international human rights and social activist organizations including: Last Mile Health, Phoenix Allies for Community Health, Maricopa Alliance for Shelter and Housing, Mixed Voces, and AaryogyaSeva. Juan’s recent work in Phoenix includes shooting and editing corporate documentaries and running CGM, which has produced documentary shorts highlighting myriad social and political issues. 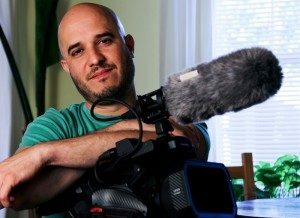 He is currently producing and directing Salud Sin Papeles : Health Undocumented which will be his first feature-length documentary. His work on this project awarded him the highly-competitive Artist Research and Development Grant from The Arizona Commission on the Arts in 2016.